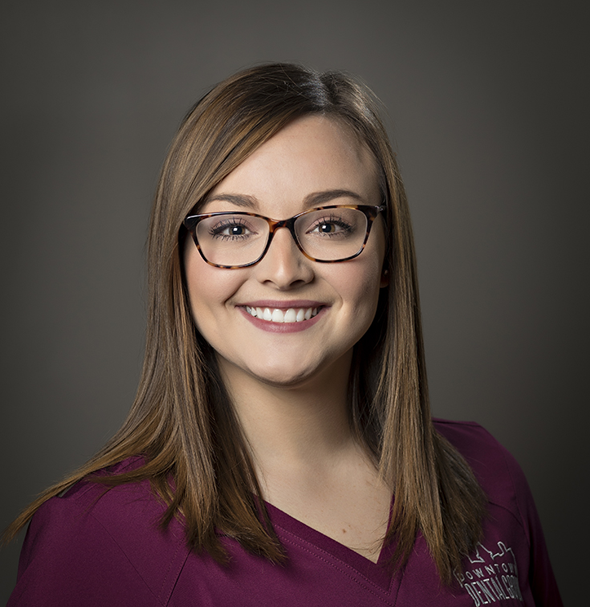 Hallie Keller is a Dental Hygienist with Downtown Dental Group. Working at DDG allows Hallie to use her talents to help and give back to the community. She also has amazing co-workers! They have become like family and are a huge part of Hallie’s life. She considers herself lucky to be able to say “working is hardly working” because she experiences so much joy while working at DDG. Her most memorable moment at DDG was when she had just gone through something tragic and heartbreaking and was feeling devastated, but when she went into work, she was showered with flowers, hugs, letters, and words of sincerity. This perfectly demonstrates how amazing, caring, faith-filled, and generous the staff at DDG is. Hallie got into dentistry because she knew she wanted to have a career where she could have an opportunity to connect with people. She also knew she wanted to be in healthcare. While in college, Hallie shadowed a dental hygienist and instantly fell in love with the profession. Dentistry allows her to do simple, ordinary things, such as helping people with their oral home-care routine or teaching them how to prevent gum disease. Her hope is that by doing this, she can affect people in a positive way. Something that patients might not know about Hallie is that she plays both the guitar and piano. When she is not at work, she loves singing, playing the guitar and piano, visiting her family and friends, traveling, and exploring the outdoors. The best way to win Hallie over is through flowers, chocolate, and Taylor Swift. Her Achilles’ heel is babies. Hallie will do anything for babies! Hallie wants her patients to know that cavities are contagious! Cavity-producing bacteria can be passed from person to person, whether it be from kissing, drinking from the same cup, etc.! You can ask her more about it when you go to your next cleaning.